A representative of Expeditio participated on Wednesday, May 16, 2012 at the conference on homelessness organized by the Housing Center from Belgrade. Housing Center, in partnership with the organization DISC from the UK, is realizing the project “Social Inclusion of Homeless Persons in Serbia“, and one of the activities within the project was organizing of the mentioned conference. 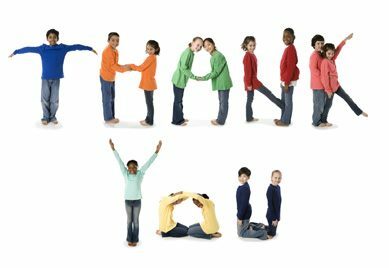 We would like to thank all those who contacted us by e-mail and FaceBook to congratulate us for our birthday. We would like to apologize in advance if we fail to reply to all of you individually, but we want you to know that we were very glad and touched by your contacts and your support. On May 10, 2012, Expeditio is celebrating 15 years of its existence. 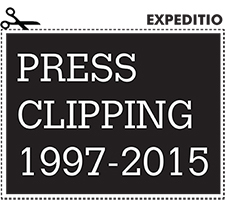 Our first, student project - Expedition Perast '97 was realized in 1997. 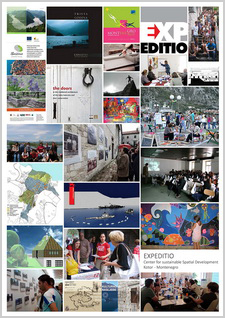 Since then, our organization has realized over 50 projects and a large number of various activities in the field of cultural heritage, sustainable architecture and physical planning. 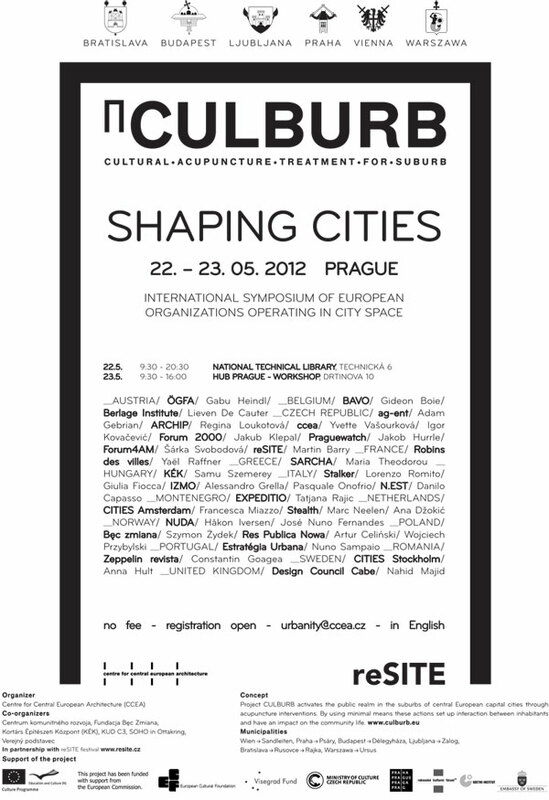 Participation in symposium: "Shaping Cities - International Symposium of European Organizations Operating in Space City" Prague 22-23. May 2012. Expeditio took part in an international symposium entitled "Shaping Cities - International Symposium of European Organizations Operating in Space City" which took place in Prague 22-23. May 2012. Ministry of Sustainable Development and Tourism within the project: "Fostering dialogue and partnership for sustainable development between the Government and the business sector in Montenegro", which the Government of Montenegro implements in cooperation with the Agency NL in the Government of the Netherlands, formed the Network for Corporate Social Responsibility (Network CSR). Network member is representatives of Expeditio Biljana Gligoric. The objective of the formation of the Network for CSR is to promote and raise awareness of the state administration, professional institutions and business and professional associations as well as the general public about the concept of corporate social responsibility as one of the mechanisms for sustainable development. Members of Network are representatives of state and academic institutions, business and professional associations, and professional and civil society organizations. 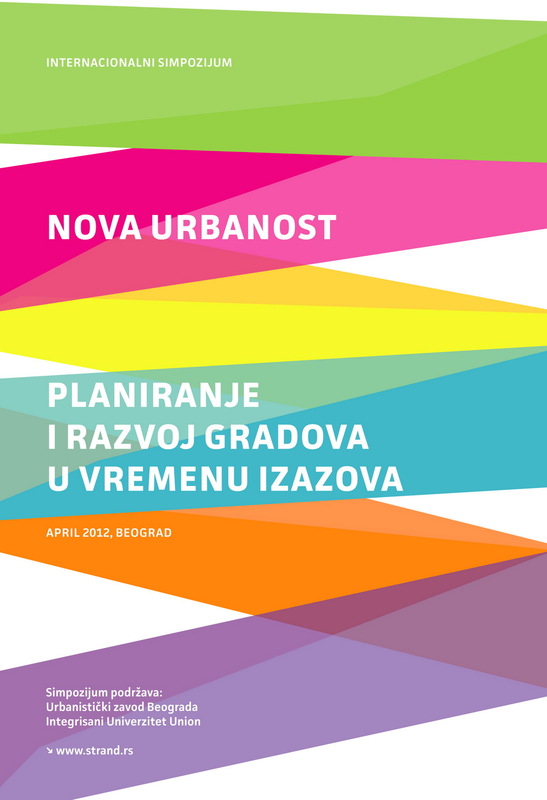 Network members tasksTasks are related to active participation in the preparation and implementation of the Action Plan network, then making the Manual for CSR for SMEs in Montenegro, tracking workshops and other meetings on the topic of CSR, preparing Network bulletin and participation in the organization of joint concrete socially responsible initiatives. The first meeting of the Network was held on Friday, April 27th at 10 am at the premises of the Ministry of Sustainable Development and Tourism. 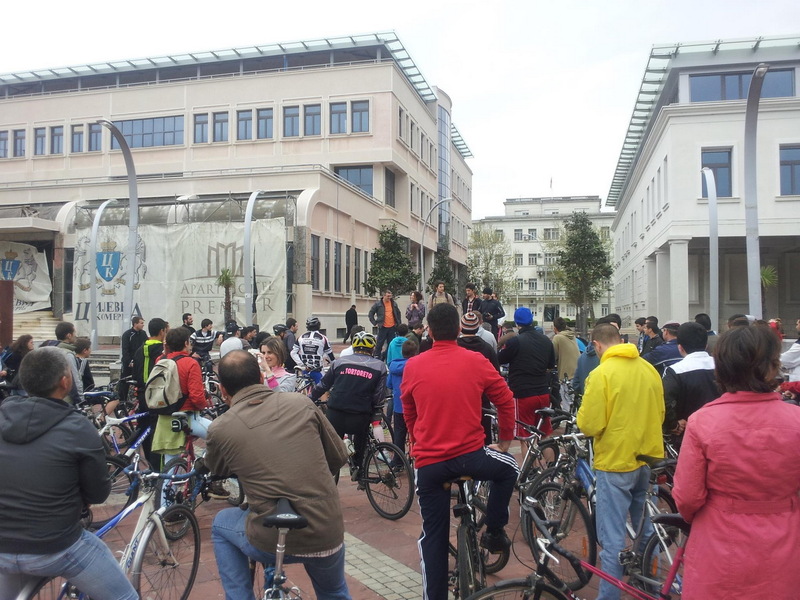 On the Earth Day, 22.04.2012, members of social networks TW, FB, G+,... from Montenegro organized #BicikloUP, bicycle ride through the streets of Podgorica. The goal of the action was to draw attention that Montenegrin towns need bicycle paths, in order to promote this type of transport and recreation but also to celebrate the Day of our dear Planet Earth. A few days ago, within the project CORNERS, Balkan expedition set off with thirty artists and researchers from 7 countries from Europe who look for stories and inspiration for the work by travelling. 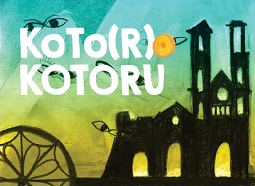 This artistic venture of crossing the rocky Balkan started in Zagreb on 15.04.2012, and it ends in Rijeka on 29.04.2012. The CORNERS expedition will be in Cetinje on 23.04.2012. 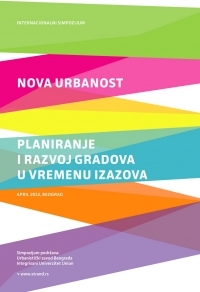 Participation in symposium "NEW URBANITY: Cities vs. Global Challenges"
Schools and universities have great potential to serve as living laboratories for education of generations that will accept environment protection as a part of their everyday life. School and university campuses are specific urban units because they remind in their form and their function of miniature settlements. 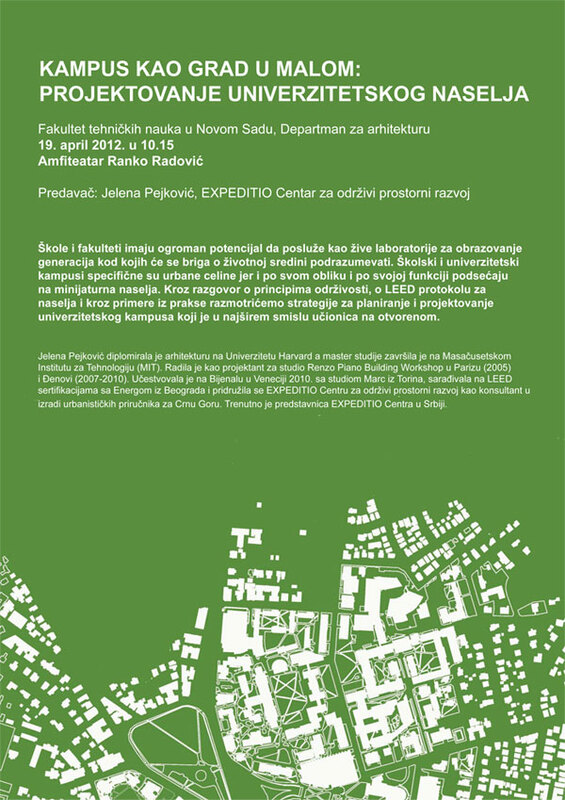 Strategies for planning and designing university campus, which is an open space classroom in its broadest sense, will be considered through discussions on the principles of sustainability, on LEED protocol for settlements and through examples from the practice. 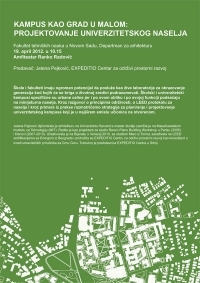 A lecture on the topic of “Campus as a Miniature Town: University Complex Design” will be held in Novi Sad, at the Faculty of Technical Sciences (Department for Architecture Lecture hall Ranko Radović), on April 19, 2012 at 10.15h. The lecturer is Jelena Pejković, the representative of Expeditio in Serbia. 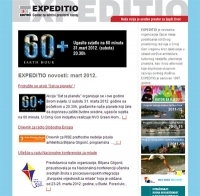 Expeditio news for the March 2012 can be read here. “Earth Hour 2012” will be organized worldwide on Saturday, 31 March 2012, from 8.30 p.m. to 9.30 p.m. At this hour, citizens worldwide will turn off their lights for one hour to raise awareness about the need to take action on climate change. In Montenegro, the event will be organized by the NGO Green Home from Podgorica, in cooperation with partners from different Montenegrin towns. 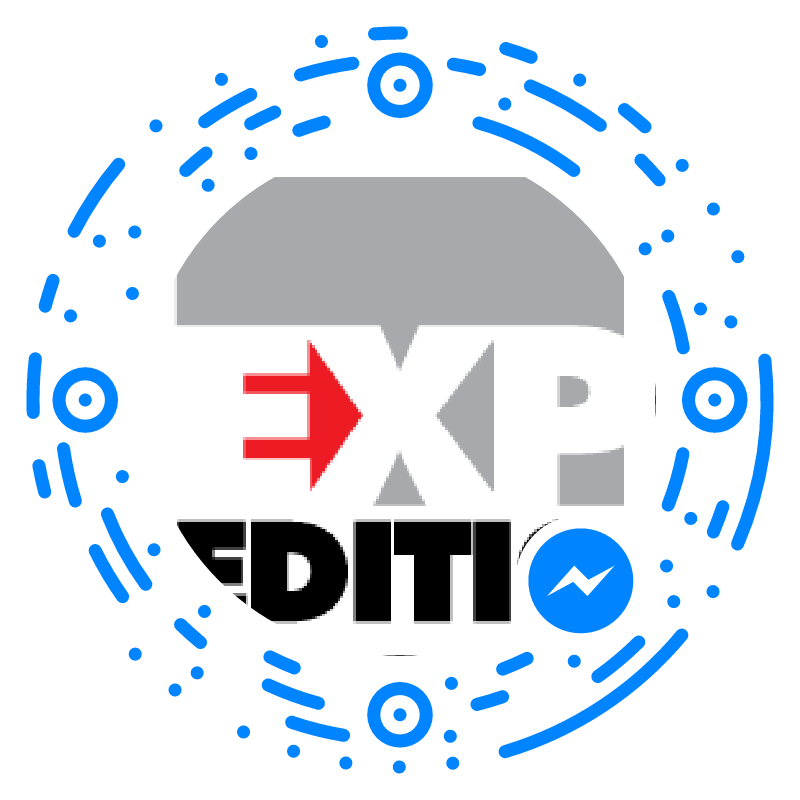 Expeditio supports the action. We invite all the citizens, institutions, households and businesses to participate in the event by turning off their lights, contributing in that way to protecting our planet. 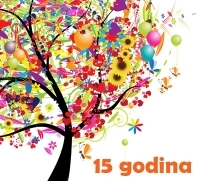 Akcija "Sat za planetu" organizuje se i ove godine širom svijeta. U subotu 23. marta 2013. godine sa početkom u 20.30h, građani/ke naše planete koji žele da doprinesu zaštiti životne sredine, ugasiće svjetla na 60 minuta. Expeditio podržava akciju i ove godine. 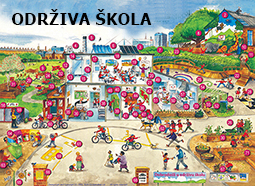 Pozivamo i sve građane/ke, institucije, preduzeća i sve zainteresovane, da se pridružie inicijativi i na taj način doprinesu očuvanju naše planete. Action "Earth Hour" is organized this year around the world. On Saturday, March 29th, 2014, starting at 20.30h, citizens of our planet who want to contribute to environmental protection, will turn off the lights for 60 minutes. Expeditio also supports this action. We invite all citizens, institutions, businesses companies and all interested parties to join the initiative and thus contribute to the preservation of our planet. 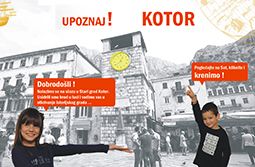 Radio Free Europe’s Diary for the last week was written by the architect Biljana Gligorić, programme director at Expeditio, Centre for Sustainable Development in Kotor. The diary can be listen to and read here. 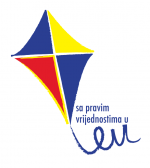 EXPEDITIO representative, Biljana Gligorić, participated in the National Conference for secondary school students focusing on the European integration process, organized within the project “Enjoying European Values for Young People”. The conference was held in Budva from 23rd to 26th March 2012. In addition to being a visiting lecturer at the panel discussing the topics of environmental protection and sustainable development, Biljana moderated a working group treating the same subjects. The conference was organized by the NGO Juventas from Podgorica, in cooperation with the project partners. Additional information on Juventas can be found here.